Rent Washington Country Fair Complex | Corporate Events | Wedding Locations, Event Spaces and Party Venues. From the best carnival rides around, to the farm animals, amazing food booths, the roar of the motorsports, and great stage entertainment, we have something for everybody. 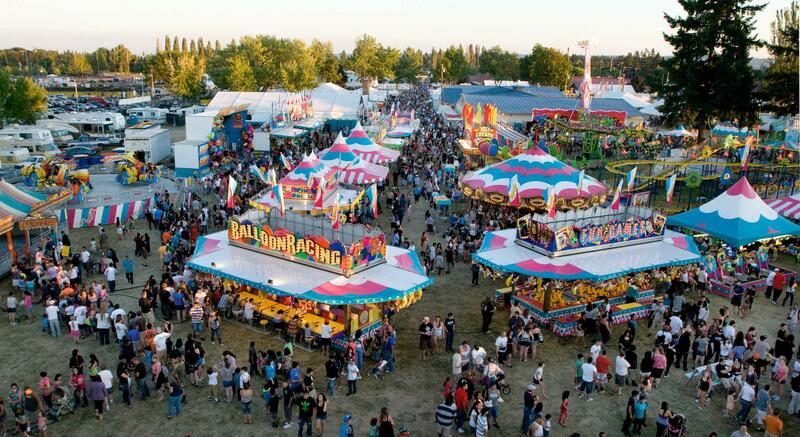 Your summer is not complete without a visit to the Washington County Fair at the Fair Complex in Hillsboro! The Cloverleaf Building has 3,200 square feet of open space, and is used for everything from private parties, to business meetings, sales presentations, workshops, community "Open House" events, and much more. It has a large kitchen that can accommodate the caterer of your choice. The built-in sound system enables you to give a presentation using a wired or wireless microphone, whichever you prefer. When you rent the Cloverleaf Building, our inventory of tables and chairs are included, and will be set up for you and torn down by our Event Staff. Two different styles of podiums are available to be rented for an additional charge, as well as a projection screen. The Main Exhibit Hall is a 24,000 square foot building with posts, made up of the 16,000 square foot North end, and the 8,000 square foot South end, which are separated by a roll-up door and a double-wide hinged door. For consumer trade shows wishing to use all 24,000 square feet, those doors are opened, allowing for easy access through the whole building. Entire Building: 24,000 square feet. North Section: 16,000 square feet total, with North Room at 80’ x 100’ and Middle Room 100’ x 80'. Occupancy: 1000 for the North Section, 500 for the South Section. Friendship Square is an outdoor covered area, with a cement floor measuring 3,534 square feet (93' x 38'.) Friendship Plaza is approximately 2 acres of open grass next to Friendship Square, and is included with the rental. This area is popular for picnics, dog shows, and is home to the annual Tualatin Valley Garden Club Plant Sale.